Travis' Folly before 1933. Smoke stain shows where the railway ran. The site of Travis'Folly, taken from the air by Neil France. Middle-right is Postern Lodge Farm. 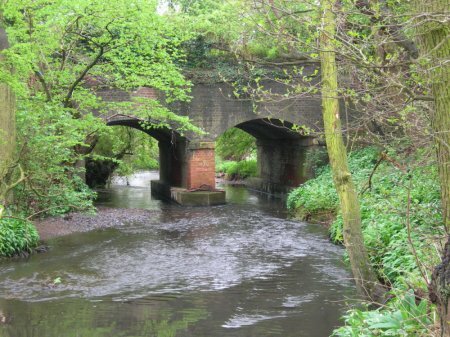 One arch of the old viaduct survives as a bridge over the River Ecclesbourne. 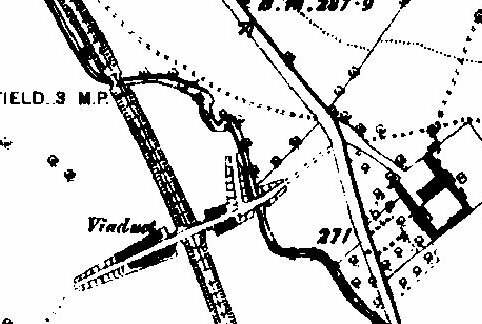 From an 1887 map, showing where the viaduct was until 1933. See www.old-maps.co.uk and enter the co-ordinates 431026, 346123. 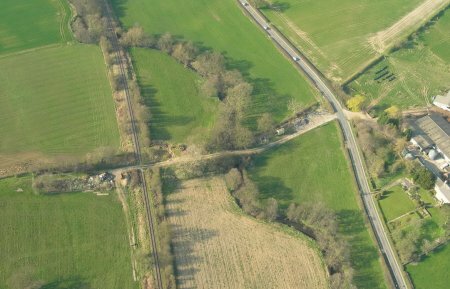 This amazing viaduct just North of Shottle, was built to to take a farmer's cows over the Duffield-Wirksworth railway line in safety. The farmer, Thomas Travis, said the ground was too muddy for a conventional crossing, and so a 19-arch viaduct was built 400 yards long. Perhaps he wanted to use the arches as barns, but the Midland Railway built fences to foil this plan, and it became known as "Travis' Folly". The viaduct was built about 1865, and the Thomas Travis involved was born in Ible in 1823 and died in 1867. 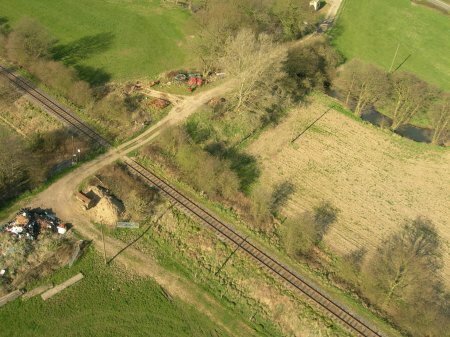 The viaduct was blown up by the military in 1933, but traces can still be seen, between Postern Farm and Postern Lodge Farm (where Thomas lived), where 2 arches take a footpath over the River Ecclesbourne. The full and rather complicated story is told in The Wirksworth Branch by Howard Sprenger, pages 72-75. Thomas TRAVIS was born on 27 Mar 1823 at Ible, baptised on 27 Apr 1823 at Wirksworth, married Jane Elizabeth WESTON at Ashbourne on 7 Oct 1858 and died around March 1871. He lived at Postern Lodge Farm as a tenant farmer from 1860 to his death aged 47. Where the viaduct of Travis' Folly used to be. All that remains of Travis' Folly, where it crosses the Ecclesbourne. Taken 2007 by Neil France. He writes: "Today I drove past Postern lodge farm, and so took the opportunity to call and ask for a look at the remnants of the folly. The ramp up to what was the start of the viaduct on the western side is still there, but little other evidence of the impressive structure which stood there, and all the commotion and excitement of it's demise".